Citation: Wright, P.M., Jacobs, J.M., Howell, S., Ressler, J.D. Immediate outcomes and implementation of a sport for development coach education programme in Belize. Journal of Sport for Development. 2018; 6(10): 45-59. While sport for development programmes can be found across the globe, there is a gap in the literature describing and evaluating programmes that have been proven successful in Latin America and the Caribbean (LAC). The Belizean Youth Sport Coalition was a two-way coaching exchange project that spanned three years. The goal of this project was to promote positive youth development and social change through sport in the small Central American nation of Belize. The purpose of the current study, which is part of a larger ongoing evaluation, was to assess the immediate outcomes of the education programme provided to 33 youth sport coaches in the first year of the project as well as their subsequent implementation. Multiple data sources indicate the education programme was effective in terms of participants’: (1) satisfaction with the training, (2) content knowledge, (3) attitudes and beliefs, and (4) capacity to implement the contents of the education programme. This study contributes to the sport for development literature by highlighting the important relationship between coach education and programme implementation. Moreover, it contributes to the literature on programmes that have been proven feasible and culturally relevant in the LAC region. The number of organisations sponsoring Sport for Development and Peace (SDP) programmes around the world has increased steadily in recent decades. These programmes vary in their approach and focus. Some are designed to promote cultural exchange and understanding,4,5 while others are meant to foster social change by addressing issues such as violence and drug trafficking.6,7 While such programmes are sponsored on all continents, academic literature describing and evaluating programmes in Latin America and the Caribbean (LAC) remains sparse.8 While the treatment of SDP programmes in the LAC region has increased slightly in recent years, this literature remains insufficient given the need and the amount of programming delivered. To this end, the current study describes and evaluates a coach education programme that was part of a larger SDP project recently conducted in Belize. Formerly British Honduras, Belize gained its independence as a democratic nation in 1981 although it remains connected to the United Kingdom as a member of the Commonwealth. This small nation shares many struggles with its neighbours throughout Central America including high incidences of drug trafficking, interpersonal violence, and gang activity.9 However, Belizean culture is also strongly linked to the Caribbean because it is situated on the coast, which includes many small islands, and is framed by a substantial portion of the Meso-American reef. It is the only Central American nation where English is the official language, although Creole and Spanish are commonly spoken. For these reasons, Belize is a particularly interesting cultural context to examine SDP initiatives that may inform others in the LAC region. The Belizean Youth Sport Coalition (BYSC) project was funded by the U.S. Department of State’s Sports United programme10 from 2013 to 2016. The goal of the BYSC was to promote positive youth development and social change through youth sport. Due to the small size of Belize, limited infrastructure for youth sport, and lack of capacity in many youth serving organisations, a key strategy in the BYSC was to bring together coaches and administrators from various organisations to form a coalition with a shared mission.11,12 The hope was that these organisations could support one another, share expertise, and develop a critical mass sufficient to influence the culture of youth sport programming in Belize. The BYSC project was guided by the following goals: (1) to increase member organisations’ effectiveness in promoting youth development and social change through sport, (2) to increase coaches’ knowledge, confidence, and skill in using empowerment-based coaching strategies, and (3) to create the capacity within the BYSC to sustain and expand activity after the initial funding period. This training programme was designed to yield outcomes related to participant satisfaction, learning and behaviour as well as institutional changes. The major components of the BYSC project included administrator training to foster organisational change, coach education to influence practice, ongoing consultation to support top-down and bottom-up change, coalition expansion, and the development of sustainable local capacity. In conversation with the Public Affairs Section of the U.S. Embassy at Belmopan, we recruited a Belizean woman who worked in a youth-focused government department to serve as our In-Country Coordinator (ICC). The ICC’s role was to facilitate logistics and assist, as a cultural insider, with networking, gaining access, and building trust as we approached Belizean organisations about joining the coalition. We initially recruited five organisations to establish the coalition including city government, national government, and non-profit entities that operated youth sport programmes as part of their mission. Once engaged in the project, directors from these five organisations provided further input on the development of the project. One of these directors, in fact, volunteered to take on the role of a cultural advisor for the project. This individual, also a Belizean woman, was uniquely suited to this role as she had been involved in Belizean sport her entire life, including leadership roles. She also lived in the U.S. where she earned a doctoral degree in sport management. Therefore, she was uniquely suited to advise on cultural and contextual differences. Her involvement and buy-in also helped to establish credibility and trust for the American team among Belizean participants. By the end of the three-year grant, 28 organisations joined the BYSC and sent staff and/or administrators to trainings. Members came from offices and departments in the national government (e.g., Department of Youth Services in Belize’s Ministry of Education, Youth and Sports), city government (e.g., Belize City Council, Youth and Sport Office), higher education (e.g., University of Belize, Athletics), and the non-for-profit sector (e.g., YMCA of Belize). Regarding social issues, representatives from most organisations wanted to address inter-personal violence. For example, they reported wanting to help youth develop the self-control and decision making skills to help them avoid and/or resolve conflict peacefully. Using sport programming as a vehicle to teach such life skills was seen as a feasible way to achieve this by BYSC members. In total, 129 individuals visited the U.S. for training: 12 administrators; 108 coaches, teachers, and youth workers received coach education; and nine individuals were trained and certified as BYSC coach trainers to serve as local leaders. A more comprehensive description of the project can be seen in Wright and colleagues’12 book chapter. An empirical article describing the transformational learning experiences of highly engaged Belizean partners has also recently been published.11 While these publications and forthcoming studies report on different aspects of the project, the current study specifically examines the education programme delivered to Belizean coaches in the first year and their capacity to implement what they learned. The Teaching Personal and Social Responsibility (TPSR)13 instructional model was a central feature of the coach education programme. TPSR is an empowerment-based approach that was developed in practice for more than 40 years. The model uses sport as a vehicle for teaching values and life skills that can be applied in other settings. The primary goals of the model include taking on more personal (e.g., motivation, persistence, goal setting) and social (e.g., respect for others, peaceful conflict resolution, and leadership) responsibility in the programme setting and then applying these responsible values and behaviours elsewhere, such as in the school, neighbourhood or home. 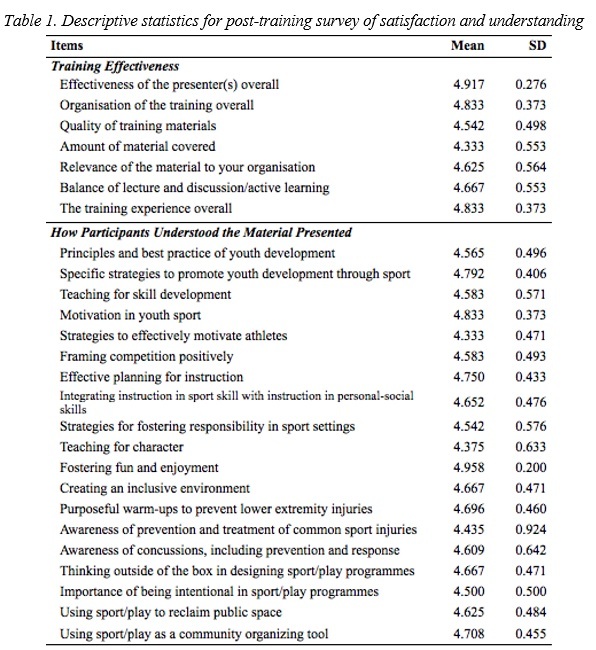 Despite the importance of coach education in influencing programme implementation and subsequent youth outcomes, this aspect of SDP initiatives is often neglected.11,46 Without seriously evaluating coach education and implementation as well as the relationship between the two, scholars and programme developers are ill-equipped to interpret results related to participant outcomes.17 As the corpus of SDP literature grows, there is a need for more explicit evaluation of coach education and implementation to enhance our ability to interpret findings and generate theory. Based on the preceding rationale, the purpose of the current study was to assess the immediate outcomes of the education programme provided to youth sport coaches in the first year of the BYSC project as well as their subsequent implementation. This study was part of a comprehensive evaluation of the BYSC that employed mixed methods to evaluate various aspects of the project.47 It was reviewed and approved by the Institutional Review Board for research ethics at our university. Our evaluation approach aligned with the notion of utilitarian pragmatism48 as it assessed the education programme relative to its stated goals as evidenced by concrete and practical outcomes. Our approach was also influenced by realistic inquiry49,50 because it was designed to meet the needs of a particular programme in a contextualised manner with the data that were available and/or feasible to attain. With this approach we tried not only to determine if the programme was “working”, but for whom and under what circumstances. Multiple methods were used to assess the coaches’ satisfaction with the training as well as its impact on their knowledge, attitudes and beliefs. Data were collected before, during, and after the training programme. At a four-month follow up, data were gathered to assess how well the education programme had prepared coaches to implement the strategies and best practices it promoted. The evaluation plan and procedures were shared with the ICC and cultural advisor prior to the training so they could comment on instruments and data collection procedures to ensure there was no unintended bias related to personal characteristics such as gender, political affiliation, or local issues unknown to the American team. Participants included 33 Belizean coaches (23 male, 10 female) from organisations that joined the BYSC in the first year. Their average age was 30.52 years old (SD 6.10). Most participants worked in or near Belize City, which is the country’s largest city and is located on the coast. However, some participants travelled from more rural regions farther inland (e.g., bordering Guatemala). All participants spoke English but were of African, Creole, and/or Mayan descent. Participants attended a four-day BYSC coach education programme delivered in March 2014 at a continuing education centre in Belize City. The centre provided a large conference room sufficient for lecture, discussion and demonstration activities. Outdoor space, including a basketball court and open field, were available for demonstration lessons and practical sport activities. These lessons and activities included basketball, soccer, martial arts, physical fitness, and team building. Of these, basketball and soccer were the most commonly played sports in BYSC organisations. However, we believe there was sufficient variety in our examples to demonstrate the concepts and strategies from the training could be applied with any physical activity. Data collection related to implementation at the four-month follow-up occurred in Belize City in July 2014 when many summer camps were operating throughout the city. Due to the high temperatures, most camp activities took place outdoors in parks, courtyards, playing fields, and a hotel swimming pool. Across multiple site visits and meetings, the first author was able to follow up with 11 of the coaches trained in March, one-third of entire group. Eight of these participants were observed coaching or directing youth programmes. Following the recommendations of SDP scholars,36 we endeavoured to shape the coach education programme with local input. In setting aims for the BYSC at the grant proposal stage, we integrated input from the Public Affairs Section at the U.S. Embassy as well as conversations with several Belizeans involved in youth sport programming. At this stage, all parties agreed that it was important to make the training relevant to issues of inter-personal violence. The focus of the project, including the coach education programme, was further refined with input from the first five Belizean delegates who came to the U.S. on an exchange visit in January 2014. For example, these delegates explained that there was virtually no professional development or certification available for youth sport coaches in Belize. Therefore, they encouraged us to integrate fundamental material including how to create a positive motivational climate, coaching for skill development, injury prevention, and effective planning. Even during the four-day training programme, minor adjustments to the planned topics and schedule were made based on participant input. For example, during daily debriefing sessions, participants gave feedback on which topics or modes of practice they thought would be more effective or useful for the following day, such as replacing trainer-led presentations with participant-led action planning at the end of the week. The training team for the March 2014 coach education included four male professors specialised in physical education and sport pedagogy, the TPSR model, sport-based youth development, and athletic training. The training team also included two consultants (one male, one female) with expertise in the TPSR model, sport psychology, community sport programmes, and sport for development. All members of the training team had extensive practical experience working with youth in their respective fields as well as university and/or professional development teaching experience. The team met prior to the course and debriefed daily throughout to coordinate their efforts, avoid gaps and redundancy across their sessions, and ensure that the curriculum was relevant and responsive to their audience. The educational programme lasted approximately eight hours per day. The daily routine involved registration and light breakfast followed by the first morning session, break, second morning session, lunch, first afternoon session, and finally a second afternoon session. Two educational sessions were always run concurrently so the participants could be divided into smaller groups to maximise interaction. In line with the aims of the project, several sessions were devoted to the principles of youth development and specific coaching strategies from the TPSR model. Related to social change, sessions were devoted to action planning, using sport to reclaim public space, and community organizing. Some topic areas were integrated into the curriculum based on input from the first BYSC delegates who visited the U.S. in January 2014. This validated survey was administered pre- and post-training. Prior to the first session on the first day and after the last formal session of the course, participants completed a self-efficacy survey that asked them to report their feelings of confidence for teaching personal and social skills through sport (e.g., cooperation). This eight-item scale is rated from 1=not confident at all through 10=extremely confident. This scale was drawn from the Exemplary Physical Education Curriculum (EPEC) Self-Efficacy survey.51 This survey’s reliability has been demonstrated by showing satisfactory levels of internal consistency and convergent and content validity. In July 2014, the first author returned to Belize to conduct a four-month follow up. The ICC helped to identify BYSC trainees who were implementing summer programmes at that time. Based on access and availability, 11 (8 male, 3 female) participants working in eight different programmes were recruited for interviews. This subsample constituted one-third of the original trainee group. These interviews were semi-structured and conversational in tone, typically lasting 30 minutes. Main topics addressed included recollections of the March 2014 training experience, description of the current sport programme being delivered, examples of integrating training content into coaching, barriers and facilitators to implementation, as well as recommendations to improve the training programme and ongoing support. Interviews were audio recorded and transcribed verbatim. The first, third and fourth authors were part of the training team that delivered the coach education programme in March 2014. All three recorded their observations and reflections during the training week. Feedback elicited during informal conversations were also frequently documented in these journals. Generally, entries were made in the evening or morning hours (i.e., before or after training sessions). Entries were made directly into electronic files called field journals. The first author used the same approach when conducting site visits during the summer. Artefacts and documents were retained throughout the study. Planning documents, correspondence, the original project proposal, as well as handouts and PowerPoint presentations are materials generated prior to the delivery of the coach education programme. Registration and attendance records, video footage and photo documentation are materials that documented the delivery of the training programme. We also retained correspondence with the ICC, reports to the funding agency, and media coverage were generated between March and July. During July, additional video footage and photo documentation was gathered. Qualitative data were analysed with a combination of deductive and inductive analytic strategies.54 The value of this approach has been promoted in sport-related research55 and has proven useful in previous TPSR programme evaluations.11,15,26 Specifically, data were organised using a priori codes that attributed units of meaning to key concepts of interest such as satisfaction, learning, attitudes and beliefs, transfer of learning, relevance, application, and the various aspects of the TPSR model. Once data were coded and organised, inductive analysis was undertaken to identify emergent themes and patterns within these broader categories. Higher order themes and subthemes were determined through consensus with all authors. Illustrative quotes were selected to integrate into the narrative based on how well they characterised the meaning of the various subthemes. Trustworthiness in this evaluation was enhanced using several well established techniques.47,56 Chief among these were the triangulation of multiple data sources and methods. Member check procedures consisted of debriefing interviews with several leaders in the BYSC to share and discuss the initial interpretations of the research team. Extensive peer debriefing occurred among the members of the evaluation team throughout the process. Credibility is also enhanced due to our detailed knowledge and direct experience with the project over an extended period of time. Regarding reflexivity, we were sensitive to imbalances in power. Because members of the American training team were both delivering the program and also conducting the evaluation, they made efforts to create a climate of partnership and minimise this power differential. Specifically, the local voice was prioritised through encouraging honest feedback during structured feedback sessions within the training program as well as through member checking during data collection and analysis. Efforts were also made to establish meaningful relationships with participants in order to foster a sense of of mutual respect and openness. The ICC, cultural advisor and other BYSC directors were helpful in assuring participants that their voices were valued and should be heard. Despite these proactive attempts, some participants may have been uncomfortable sharing negative or critical perspectives due to the inherent power differential. Awareness of this potential tension informed our approach to gathering, analysing, and reporting data. The cultural advisor, in particular, was helpful as a critical friend as we discussed our findings and interpretations. Results are organised as they relate to the following outcome areas: satisfaction, knowledge, attitudes and beliefs, and implementation. In each subsection, the relevant quantitative results are presented first followed by qualitative results. The upper portion of Table 1 displays the descriptive statistics from the training feedback survey, which assessed the general effectiveness of the training. All items assessing the participants’ overall satisfaction with the training were found to be above 4.3 (out of 5), with overall effectiveness of the presenters scoring the highest at 4.92 (out of 5). The positive quantitative ratings were highly consistent with trainer observations and feedback provided throughout the course. Open comments on the feedback surveys coincided with quantitative ratings. Participants were particularly positive about the quality of the training, the relevance of the material, as well as the social and active nature of the sessions. Regarding the quality of the training, one male participant stated, “The sessions are very informative. Instructors are well prepared and have a great knowledge of what they’re presenting”. A female participant shared, “I am able to be in the session and understand all the material being introduced to me. I get to participate openly and I feel comfortable with the pace that instructors are moving at”. Another male wrote, “I like that the facilitators are clear in what they’re saying and that they use great examples that reflects on their teachings”. Although asked to identify weaknesses and make recommendations to improve the training, few individuals raised concerns. Some participants suggested more materials could have been provided and that more time would have been beneficial, but no strong patterns emerged. Many participants made comments about the relevance of the content to their context. For example, one male participant said, “All aspects of the training are useful in the work I do from my office and especially on the field”. Apparently referring to debriefing sessions that focused on participants’ real life examples, a female listed one strength as, “When we had open discussions about our different experiences when it comes to the camps”. Another female participant provided a concrete example of how the content would be relevant to a new role she was about to undertake. She stated, “Key points are the drills and warm-up section that I can use in my ball game with my kids as I venture into the coaching of basketball for my first experience with basketball”. In their feedback, many participants expressed satisfaction with the social and active nature of the learning. For example, a female participant wrote, “I liked the group work which allowed each and every one to be interactive and think of ways to make a sport be fun“. One of her male counterparts observed, “Thus far, I like the group interactions and the information given to me because I’m building my knowledge am gaining a lot of skills that I can implement in youth development”. Some participants appreciated working as peers with people from different organisations and with people from different areas of their own organisation. One gentleman stated that he appreciated, “Being able to connect with the people you work with of all different levels and how to interact respectfully”. The lower portion of Table 1 displays the descriptive statistics from the training feedback survey, which assessed how well the training helped the participants understand the topics covered during the training. These items were all found to be above 4.4 (out of 5) with fostering fun and enjoyment scoring the highest at 4.96 (out of 5). These self-reported learning gains were supported by checks for understanding captured on video and reflected in field journals. Eighteen of the 19 topics addressed in Table 1 were mentioned in open comments on feedback surveys. The only topic not mentioned directly was concussion awareness, although general references to sport injury response and prevention were made. The topics mentioned most often were youth development, coaching strategies, and the transfer of life skills. I’ve learn to prepare my team to have trust and confidence in each other no matter what the situation is. The skills to create activities for you to learn each other’s difference so that they can accept this difference and live in a more peaceful and minded environment for everyone. Demonstrating his understanding of concepts and how to frame them, one male shared, “I will apply the SMART [specific, measurable, attainable, realistic, time-bound] strategies to help youths make good goals. I will use motivation both extrinsic and intrinsic to help them to complete their goals”. Finally, the transfer of life skills appeared to be a new way to frame an idea that resonated deeply with many of the coaches, which was mentioned frequently. Many coaches also used specific examples to demonstrate their understanding. A female stated, “For me (transferring) applying what you do and learn in sports you can apply those skills in your everyday life (life skill, self-control, and motivation)”. Table 2 displays the mean variables for all items and the self-efficacy for teaching personal and social skills construct administered at pre- and post-training, as well as change in (Δ) scores. The participants who completed both the pre- and post-training survey (n = 18), on average, perceived their self-efficacy levels for the construct and all items to be above 8.6 (out of 10) upon completion of the training programme, with many of the items above 9.1 (out of 10). All items and the self-efficacy construct showed increases from pre- to post-survey administration. Results of the paired-samples t-test are included in Table 2 along with the related Cohen’s d value. The increase across the self-efficacy construct from pre- to post-survey administration was found to be significant (p < .001, t = 6.191, d = 1.46). Moreover, the two items that saw the largest increase after the orientation training related to constructive competition (Δ = 2.16) and best effort (Δ = 1.34); while the two factors that saw the smallest increase related to respect (Δ = 0.73) and responsibility (Δ = 1.00). The most useful aspect of the training were the tools and knowledge given to me to actually connect with the kids we work with on a personal level and understand their personal situations. This will further help me know them better as a person and not just as an athlete who can help me win games. In Belize, our youth of today and the future needs those strategies to help us as a nation to become better in sports, social life and even on a daily basis. These strategies will help our youth/children to be better learners, respect others people as an individual as well as a culture, which will end up in positive result for us as a small country. My impression is that almost all of the coaches we trained value and support the principles of youth development…Based on my observations and interviews, the most commonly used teaching strategies in BYSC programmes are modelling respect, creating a positive and inclusive environment, planning activities that allow all participants to feel successful, and discussing character or life skills. I saw some brilliant examples of fostering social interaction among students, involving youth leaders in management and instruction tasks, but those were isolated examples and need to be developed more across programmes. In the following paragraphs, three examples are provided that establish links between the coach education programme and changes in practice. Two of the coaches that were interviewed and observed were Gabriele and Dale, who both worked for a government-operated sport organisation. In this capacity, they supported sport programmes and to a lesser extent physical education in primary schools during the academic year. Regarding the primary schools, Gabriele reported, “Well, we did most of the primary schools in the district, in the entire [Belize City]; roughly about 10 primary schools”. In the camp, when we were doing the specific things to achieve the particular goal of the respect, the leadership, team building, we weren’t doin’ the talkin’ part enough. I gotta be honest, that part we wasn’t stressing a lot, but that’s really what we should be stressing that part because that’s really the important part. Basically, the way the actual training was, was basically hand in hand with what we do. The way we incorporate the actual values into the actual programme is something we were lacking. [The training] gave us the main idea of how we could actual do everything smooth, including the physical and the mental…Sometimes we were doing the physical only, and then the mental afterward, but now I’m at the point where I teach both the physical and mental. As a senior coach in the programme, Manny explained that he had been stressing this new approach with his peers and the youth coaches. He reported, “telling others they are not just going to teach the sport this year but the core values too”, then added, “It was my main idea for this training for this year…not to only teach the sport but to teach and learn the values of the actual programme”. In the previous year, our life skills [instruction] was very poor because we used it in the classroom setting and their attention span is very short. So we started using the TPSR model last year and our life skills turnout was tremendous. This year, [Elijah’s programme] are experimenting with teaching life skill lessons through the sport activity (i.e., purposeful drills and activities to highlight conflict resolution and communication skills). All parties involved agree the youth find this approach much more engaging and observe that attendance and retention seem to be improved over previous years. I saw a wide range in terms of the quality of implementation of our training strategies and principles. At the organisational level, I have the impression that some have taken little action to make changes whereas others have taken concrete steps in a relatively short period of time. Consistent with this last point, some coaches received support to make changes related to scheduling, venue, curriculum, and coaching style. Other coaches met resistance to change in various forms. It is beyond the scope of this study to fully analyse organisational barriers and facilitators, but they did appear to influence implementation. A common goal in coach education is that the training content will be understood, embraced, and implemented by the coaches. However, this basic assumption is often overlooked in personal and social development programmes of all kinds.42,57,58 The current evaluation underscores the key role that training effectiveness plays in motivating and preparing coaches to implement an SFD programme. Specifically, findings presented here indicate the BYSC coach education programme was well-received by participants, increased their understanding of the content and motivated them to apply it. While many external factors influenced implementation, data indicated that much of the learning was retained and applied by a subsample of participants at a four-month follow up. The current study also contributes to the literature by providing an example of an SDP programme that proved effective in the LAC region. Although Belize is the only English-speaking nation in Central America and has a distinct culture, it shares many features with other Central American countries as well as its Caribbean neighbours. Some features of the BYSC may inform future SDP programming in the region. We found that adopting an approach that involves local expertise and promotes critical reflection3,36 seems to have fostered transformational learning as well as necessary technical and didactic learning.59 Regarding the content of the training and our approach working with the participants, the TPSR model appears to have been an effective pedagogy. This model has been successfully applied in many cultural contexts16,19,28 and the current study adds empirical support to its relevance in the LAC region. In terms of the evaluation of SDP programmes, there are many calls in the literature for robust evaluation plans that start with training.42,45,57 The current study used multiple data sources to assess a range of immediate outcomes as well as implementation.41,47 Best practices for assessing professional development and implementation of the TPSR model were employed in this study and appeared to have contributed to the rigor and coherence of the programme.17,32,33 We recommend that future SDP initiatives that involve coach education integrate strong evaluation plans into their programme. We propose that aligning evaluation measures with the training can enhance programme effectiveness.47 Finally, having an expert from the local community such as our cultural advisor to consult on the evaluation design, procedures and interpretations was extremely valuable in terms of respecting local culture, increasing credibility as well as minimizing bias and power differentials. SDP programmes are practical in nature and idiosyncratic by design. For these reasons, we found a realist inquiry framework to be quite useful, such as focusing on questions that were most relevant to the project and feasible given the access and data we had.50 We were not concerned as much with hypothesis testing as answering practical questions such as, “Is this particular programme working?” and “If so, for which participants and under which conditions?”. Nonetheless, there were several limitations in the current design. First, the ability to verify findings was limited by the fact that most data were based in participant perceptions and on self-reporting. Second, even though inferential statistics were used to assess changes in self-efficacy, our ability to attribute the changes to the training programme is limited because there was no control group. Third, despite efforts to involve participants as partners, there was an inherent imbalance of power between them and the Americans who were both delivering and evaluating the programme. Despite efforts to minimise its influence and the fact that the cultural advisor never reported any major problems in this regard, this power dynamic may have impacted participant responses. Fourth, as there is little professional development available to youth sport coaches in Belize, it is possible the strong positive reactions to this programme were influenced by the fact that any such training could be appreciated as a rare and valuable opportunity, regardless of the content. In closing, the current study describes and reports many positive outcomes stemming from an SDP coach training programme in Belize. Findings indicate the training was sufficient to enable some participants to implement the content in their work with local youth. Future studies should probe more deeply into the organisational factors that influence participants’ ability to transfer what they have learned in SDP programmes.37,39 The examples of programme implementation provided in the paper illustrate how much influence is exerted by external and contextual factors. This is especially true in programmes such as the BYSC that attempt to foster both top down and bottom up change.11,12,61 Such programmes must navigate organisational norms, cultural context, and local politics, which will vary by both country and region (e.g., the LAC). This article is dedicated to the memory of our dear friend Mr. Phillip Singh of Belize. Phillip was a local advocate for youth sport and a leader within the Belizean Youth Sport Coalition from its inception. His enthusiasm, love for his country, and belief in the power of sport for development inspired us all. Kaufman Z, Rosenbauer BP, Moore G. Lessons learned from monitoring and evaluating sport-for-development programmes in the Caribbean. In: Schulenkorf, N, Adair D, editors. Glob Sport for Dev. London: Palgrave Macmillan; 2013:173-93. Cárdenas A. Peace building through sport? An introduction to sport for development and peace. J Confl. 2013;4(1):24-33. Kidd B. A new social movement: Sport for development and peace. Sport Soc. 2008;11(4):370-80. Beutler I. Sport serving development and peace: Achieving the goals of the United Nations through sport. Sport Soc. 2008;11(4):359-69. Keim M. Sport as opportunity for community development and peace building in South Africa. Sport and Dev. 2006:97-106. Mandigo J, Corlett J, Ticas P, Vasquez R. The role of physical education in the prevention of youth violence: A life skills-based approach in El Salvador. Sport, Soc Dev and Peace. 2014;17(8):103-26. Kath E, van Buuren NG. Child soldiers, football and social change in Rio De Janeiro’s Favelas. In: Schulenkorf, N, Adair D, editors. Glob Sport for Dev. London: Palgrave Macmillan; 2013:194-215. Cronin O. Comic relief review: Mapping the research on the impact of sport and development interventions. Manchester: Orla Cronin Research. 2011. Wright PM, Jacobs JM, Ressler JD, Howell SH. The Belizean Youth Sport Coalition. In: Escherick C, Baker R, Jackson S, Sam, M. Case Studies in Sport for Diplomacy. Morgantown, WV: Fitness Information Technology; 2017:51-67. Wright PM, Jacobs JM, Ressler JD, Jung J. Teaching for transformative educational experience in a sport for development program. Sport Ed Soc. 2016;21(4):531-48. Hellison DR. Teaching Personal and Social Responsibility through Physical Activity. 3rd ed. Champaign, IL: Human Kinetics; 2011. DeBusk M, Hellison D. Implementing a physical education self-responsibility model for delinquency-prone youth. J Teach Phy Ed. 1989;8(2):104-12. Gordon B, Jacobs JM, Wright PM. Social and emotional learning through a teaching personal and social responsibility based after-school program for disengaged middle-school boys. J Teach Phy Ed. 2016;35(4):358-69. Jung J, Wright R. Application of Hellison’s responsibility model in South Korea: A multiple case study of “at-risk” middle school students in Physical Education. ÁGORA para la Educación Física y el Deporte. 2012;14(2):140-60. Pascual C, Escartí A, Llopis R, Gutíerrez M, Marín D, Wright PM. Implementation fidelity of a program designed to promote personal and social responsibility through physical education: A comparative case study. Res Q Exerc Sport. 2011 Sep;82(3):499-511. Wright PM, Burton S. Implementation and outcomes of a responsibility-based physical activity program integrated into an intact high school physical education class. J Teach Phy Ed. 2008;27(2):138-54. Escartí A, Gutiérrez M, Pascual C, Marín D. Application of Hellison’s teaching personal and social responsibility model in physical education to improve self-efficacy for adolescents at risk of dropping-out of school. Span J Psychol. 2010;13(2):667-76. Escartí A, Gutiérrez M, Pascual C, Llopis R. Implementation of the personal and social responsibility model to improve self-efficacy during physical education classes for primary school children. Rev Int Psicol Ter Psicol. 2010;10(3):387-402. Cecchini JA, Montero J, Peña JV. Repercusiones del programa de intervención para desarrollar la responsabilidad personal y social de Hellison sobre los comportamientos de fair-play y el auto-control. Psicothema. 2003;15(4):631-37. Ward S. Forecasting the storm: Students perspectives throughout a teaching personal and social responsibility (TPSR)-based positive youth development program. Agora para la educación física y el deporte. 2012;14(2):230-47. Li W, Wright P, Rukavina PB. Pickering, M. Measuring students’ perceptions of personal and social responsibility and the relationship to intrinsic motivation in urban physical education. J Teach Phy Ed. 2008;27(2):167-78. Martinek T, Schilling T, Johnson D. Transferring personal and social responsibility of underserved youth to the classroom. Urban Rev. 2001;33(1):29-45. Wright PM, Li W, Ding S, Pickering M. Integrating a personal and social responsibility program into a wellness course for urban high school students: Assessing implementation and educational outcomes. Sport Educ Soc. 2010 Aug 1;15(3):277-98. Walsh DS, Ozaeta J, Wright PM. Transference of responsibility model goals to the school environment: Exploring the impact of a coaching club program. Phy Ed Sport Pedag. 2010 Jan 1;15(1):15-28. Gordon B. Teaching personal and social responsibility through secondary school physical education: The New Zealand Experience. Agora para la educación física y el deporte. 2012;14(1):25-37. Gordon B. An examination of the responsibility model in a New Zealand secondary school physical education program. J Teach Phy Ed. 2010 Jan 1;29(1):21-37. Beaudoin S, Brunelle JP, Spallanzani C. The journey of two physical education and health teachers in learning to teach personal and social responsibility. Revue PHEnex J. 2015;7(2):1-32. Agbuga B, Xiang P, McBride RE. Relationship between achievement goals and students’ self-reported personal and social responsibility behaviors. Spanish Jr of Psych. 2015;18:1-9. Romar JE, Haag E, Dyson B. Teachers’ experiences of the TPSR model in Physical Education. Agora para la educación física y el deporte. 2015;17(3):202-19. Coulson CL, Irwin CC, Wright PM. Applying Hellison’s responsibility model in a youth residential treatment facility: A practical inquiry project. Agora para la educación física y el deporte. 2012;14(1):38-54. Hemphill MA, Templin TJ, Wright PM. Implementation and outcomes of a responsibility-based continuing professional development protocol in physical education. Sport Ed Soc. 2015;20(3):398-419. Wright PM, Craig MW. Tool for assessing responsibility-based education (TARE): Instrument development, content validity, and inter-rater reliability. Meas Phys Ed Exerc Sci. 2011;15(3):204-19. Freire P. Pedagogy of the oppressed. New York: Bloomsbury Publishing; 2000. Spaaij R, Jeanes R. Education for social change? A Freirean critique of sport for development and peace. Phy Ed Sport Pedag. 2013;18(4):442-57. Bates R. Regulation and autonomy in teacher education: System or democracy? In: Townsand T, Bates, R, editors. Handbook of teacher education: Globalization, Standards, and Professionalism in Times of Change. Springer: Netherlands; 2007. 27-140. Wandersman A. Four keys to success (theory, implementation, evaluation, and resource/system support): High hopes and challenges in participation. Am J Community Psychol. 2009;43(1):3-21. Noe RA, Schmitt N. The influence of trainee attitudes on training effectiveness: Test of a model. Personnel Psychol. 1986;39(3):497-523. Durlak JA, Weissberg RP, Dymnicki AB, Taylor RD, Schellinger KB. The impact of enhancing students’ social and emotional learning: A meta‐analysis of school‐based universal interventions. Child Dev. 2011 Jan 1;82(1):405-32. Penuel WR, Fishman BJ, Yamaguchi R, Gallagher LP. What makes professional development effective? Strategies that foster curriculum implementation. Am Ed Res J. 2007;44(4):921-58. Seligman ME, Ernst RM, Gillham J, Reivich K, Linkins M. Positive education: Positive psychology and classroom interventions. Oxf Rev Ed. 2009;35(3):293-311. Crabbe T. Reaching the ‘hard to reach’: engagement, relationship building and social control in sport based social inclusion work. Int J of Sport Manag and Mark. 2006;2(1-2):27-40. Hartmann D, Kwauk C. Sport and development: An overview, critique, and reconstruction. J Sport Soc Issues. 2011;35(3):284-305. Petitpas AJ, Cornelius AE, Van Raalte JL, Jones T. A framework for planning youth sport programs that foster psychosocial development. Sport Psych. 2005;19(1):63-80. Ennis CD. Creating a culturally relevant curriculum for disengaged girls. Sport Ed Soc. 1999;4(1):31-49. Patton MQ. Designing qualitative studies. Qual Res Eval Methods. 2002;3(1):230-46. Green DM. Constructivist comparative politics: Foundations and framework. Constructivism and Comparative Politics. 2002:3-59. Pawson R, Tilley N. Realistic evaluation. London: Sage;1997. Pawson R, Tilley N. What works in evaluation research? Br J Crimonol. 1994;34(3):291-306. Martin JJ, McCaughtry N, Kulinna P, Cothran D, Faust R. The effectiveness of mentoring-based professional development on physical education teachers’ pedometer and computer efficacy and anxiety. J Teach Phy Ed. 2008;27(1):68-82. Tabachnick BG, Fidell LS. Multivariate analysis of variance and covariance: Using multivariate statistics. In: Tinsley HEA, Brown SD, Handbook of Applied Multivariate Statistics and Mathematical Modeling. San Diego: Elsevier; 2007. 402-7. Miles MB, Huberman AM. Qualitative data analysis: An expanded sourcebook. London: Sage; 1994. Cohen J. A power primer. Psychol Bull. 1992;112(1):155. Amis J. Interviewing for case study research. Qual Methods Sports Studies. 2005:104-38. Lincoln YS, Guba EG. Judging the quality of case study reports. Int J Qual Stud Educ. 1990;3(1):53-9. Durlak JA, DuPre EP. Implementation matters: A review of research on the influence of implementation on program outcomes and the factors affecting implementation. Am J of Comm Psychol. 2008;41(3-4):327-50. Kealey KA, Peterson AV, Gaul MA, Dinh KT. Teacher training as a behavior change process: principles and results from a longitudinal study. Health Ed Beh. 2000;27(1):64-81. Bonwell C, Eison J. Active learning: Creating excitement in the classroom ERIC Higher Education report. 1991. Bruner J. The narrative construction of reality. Crit Inq. 1991;18(1):1-21. Spivak GC. Can the subaltern speak? In: Nelson C, Grossberg, L. Marxism and the Interpretation of Culture. London: Palgrave Macmillan;1988. 271-313. Bandura A. Self-efficacy conception of anxiety. Anxiety Res. 1988;1(2):77-98.